In reference to the title of this entry, anyone who finishes Deer and has a strong sense of what the theme was is most definitely going to disagree with the following commentary. I just happened to note how the movie uses tobacco smoking as an activity, a visual to show that another character has been sucked into the whirlwind of emotions and violence created by an allegorical idea, which this movie explores. To put my frustration in perspective, let me say that I’m sure fans of Lars von Trier must love this film. For anyone who knows my opinion of that so-called artist, that should put my feelings towards Deer in immediate context. Before reading further, just know my primary goal in drafting this entry is to make sure that none of my pals back in Cincinnati see this on VOD and think, “Oh yeah! They shot that here – maybe I’ll give it a try…” Well, don’t. Let me advise any of my fellow hometown crowd to actively avoid watching this two hour exercise in frustration. Readers of this blog have surely noticed how “SKIP” entries have been rare lately, and I try to keep it that way. But with Deer, I’d rather you watch Tombstone, Happy Gilmore, Heat or any other of your favorites again for the 20th time. I do, however, insist that everything in artistic endeavor has a positive and a negative. Whether it’s a painting in the museum, a sculpture in the park, an old monument – or an independent movie like this, I like the idea that it’s healthy to talk about one’s feelings if they find the art off-putting. To briefly elaborate, I read a lot of social media commentary related to films for my business. And let me tell you, my biggest constructive criticism is simply to say you hate something is not enough. Take the time to explain why. Use your words. Avoid emojis, which always make me think of Orwell’s 1984. Describe your feelings and for God’s sake, give us a reason to finish your commentary. Naturally, I have to hold myself to the same standard. I mean, just because Deer was a “SKIP” for me, it doesn’t mean that the “artist’s intent” didn’t receive positive “audience reaction” by other moviegoers. It wasn’t received well by me, at least related to 85-90% of the film. The beloved 10-15% I’m referring to is specific to the incredible locations that the production used in my hometown of Cincinnati. In fact, some of the early scenes are shot from Covington, KY, which is also very dear to me. The resulting skyline you see of that picturesque little midwestern town had my hopes up. And, on a separate positive note, let me say that I appreciate the efforts of the actors, their interest in tackling such a script… And, I especially liked the work of cinematographer Thimios Bakatakis. Not sure if it was him or the director, but their tribute to Stanley Kubrick is noticable with Deer. Now that all the positives are out of the way, let’s dive in with the frustration. The very philosophy of the film, the question suggested by the title, was never well executed in the story or the dialogue or the visual references of the film. At least not so that I noticed it. In reading other reviews, I now understand it was presented, but that’s a bad sign in and of itself that I missed it. But, is this story with these characters in this setting the most appropriate, the most entertaining the most engaging possible for testing this theory that one life must die to balance out an improper death? From this humble bloggers perspective, no. Where’d the kid (Keoghan) learn this bit? What’s the foundation of it? If you’re trying to sell us on the idea that this mentally ill 16 year old is somehow justified in his actions… not off to a great start. I think the thing that upset me the most about Deer is the involvement of child actors and/or characters, however you want to perceive the involvement of underage people in the film. If you’re going to specifically include teens, children, sons and/or daughters in a violent, dramatic exploration of revenge, mental illness, kidnapping, murder, etc… well, son, you’d better have a good reason to do so. And, you’d damned well better execute it well here. Consider yourself 0-2, Mr. Lanthimos. I’m not a parent, but if I were, and my child’s representation sent me this script, we’d have to have a serious reset on the kinds of roles they were sending my son(s) and/or daughter(s) out for. And the response to their playing any role in Deer would be a hard but polite, no. 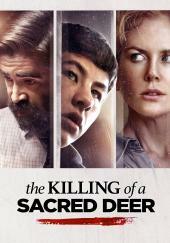 The element of a 16 year old kid – brilliantly portrayed by Barry Keoghan, to the young actor’s credit – who is meticulous and calculating enough to find some kind of poison that to my knowledge, doesn’t bloody exist, is another gaping hole right in the middle of Killing. I mean, Mr. Lanthimos co-wrote this… why not make the kid in his early 20s? As in he’s had years to investigate the whole thing? And by the way, how’d he dose the kids? How’d he get in the goddam house with no one noticing? How did he acquire this mystery postion? Did he mix it himself…? Or, is it just his understanding that an old myth is at fault? And if that’s the case… how is he an authority to bring this fact to the family? On and on the holes are exposed. And, perhaps most egregious is the impotent behavior of the hero/anti-hero, however you want to perceive him, Dr. Steven Murphy (Colin Farrell). If I had read the script well before this title was produced, I’d have asked specifically, why does a doctor this smart go to the kid’s house? Why does he bang on the door, yell at the mom, who’s apparently not home? What takes him so long to tell his wife the truth – and why would she agree to sexually please him in the manner she does in the late scenes of the film after her husband takes apparently no interest in saving their children? And for those who suggest, “Well, he had no way of saving them!” You and I must agree to disagree, because your perspective is definitely that of the filmmakers. The idea that a killer is going to tell you what he’s doing – and then you’re going to continue running tests and really taking your time figuring it out at the hospital… that is a really difficult idea for me to embrace or believe in any way shape or form. Finally, looking at things from the other perspective, that the kid had nothing to do with it and this is just the universe holding the doctor responsible for a wrongful death, well… I’d love to see the reactions to anyone if I turned in a spec like that. And another thing…. in a brief scene late in the film, Dr. Murphy goes in to talk to his kids’ principal, and he asks him, “If you had to choose one of them, which would it be…?” And the principal just… well, what? What’d he do? I think he answers something opaque like, “Well, gee… that’s a tough one.” And after the doc left, then what?!? Guess he just swiveled around on his chair, looked at some more files, took a nice long peek out the window at the green grass…?? Let me offer a four letter word: hole (as in the story, in the third act, in our very human nature). In the end, this title is a real example of my general frustrations with some films over the past several years. While Deer had a fantastic location, and ummmm… well, it had smoking in it… there wasn’t a whole lot to appreciate. I can’t imagine seeing this film in theaters at the end of a long week. I’d be furious. I mean, who the hell is the audience for the movie? This link reports it made over $5M worldwide and over $1M domestically. Were these moviegoers like me who liked Mr. Lanthimos film, The Lobster, which I thought was one of the best movies of 2016? Here’s hoping his next effort, the upcoming drama The Favourite, returns more to his sensibilities from The Lobster.